Preface: One of the objective for Aggregation Services aim to provision and manage a huge number of separate physical platforms. As a result, the international vendor like Cisco also doing the transformation of the physical network devices. And therefore we seen VM devices OS system image today. Synopsis: In order to cope with cloud computing and container environment, IOS XR 64-bit operating system (OS) is able to runs on virtualized environment with underlying 64-bit Linux kernel. As a result, the cisco product services can be extended. 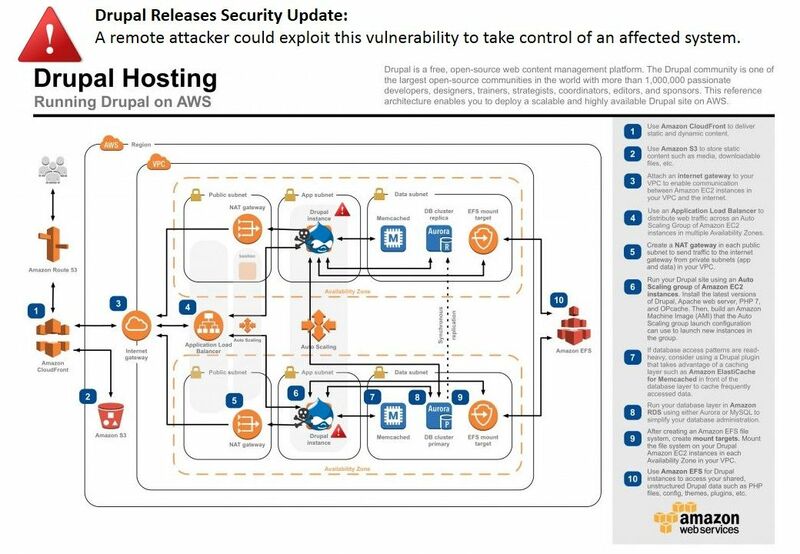 A vulnerability in the sysadmin virtual machine (VM) on Cisco ASR 9000 Series Aggregation Services Routers running Cisco IOS XR 64-bit Software could allow an unauthenticated, remote attacker to access internal applications running on the sysadmin VM. 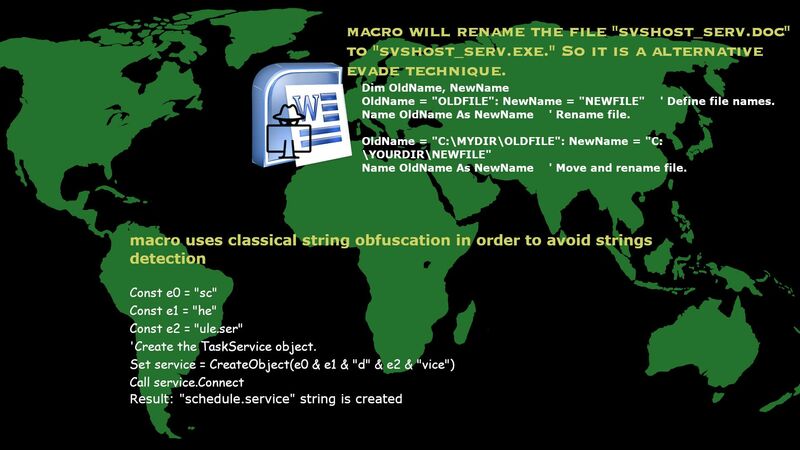 Simple and powerful evasion technique – Threat actor will be exploit MS word document. Preface: Preface: Threat Intelligence vendor (FireEye) alert that Global DNS Hijacking Campaign rapidly growth. This storm affected dozens of domains belonging to government, telecommunications and internet infrastructure entities across the Middle East and North Africa, Europe and North America. Let us think that this kind of attack seems to happen in our daily lives. Perhaps sometime even though Defense mechanism not aware. Microsoft Office documents containing built-in macros is very useful and can become a Swiss army knife to hurt you. Macros are essentially bits of computer code, and historically they’ve been vehicles for malware. Should you have interest of this topic, attach diagram can provide high level overview for your reference. Remark: Seems the SIEM endpoint event monitoring will be the effective remedy solution. However it might have involves confidential data label. So this part requires management review and separation of duties. The Department of Homeland Security urge the world and United state staying alert of new wave of cyber attack. 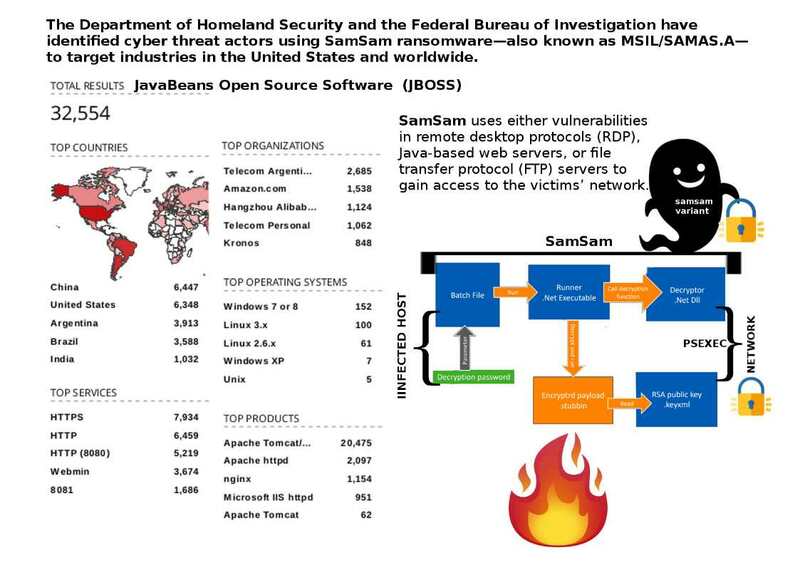 SamSam ransomware is a custom infection used in targeted attacks, often deployed using a wide range of exploits or brute-force tactics. Most likely the goal of the action is interfere the society stability. It can widespread impact on political stability. 1. Maintain up-to-date antivirus signatures and engines. 2. Keep operating system patches up-to-date. 3. Disable File and Printer sharing services. 4. Monitor users’ web browsing habits; restrict access to sites with unfavorable content. 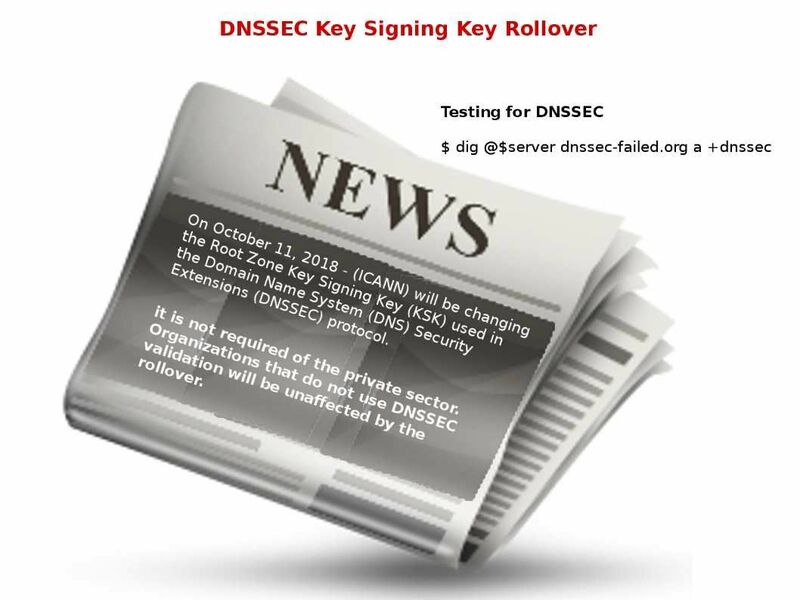 Even Though end user not affected by the DNSSEC Key Signing Key Rollover. But at least we know the internet world what is happening. For more detail, please refer below url for reference. It shown that DNSSEC is off. SIMATIC WinCC Open Architecture enables handling with bigger amounts of data with even smaller hardware solutions. 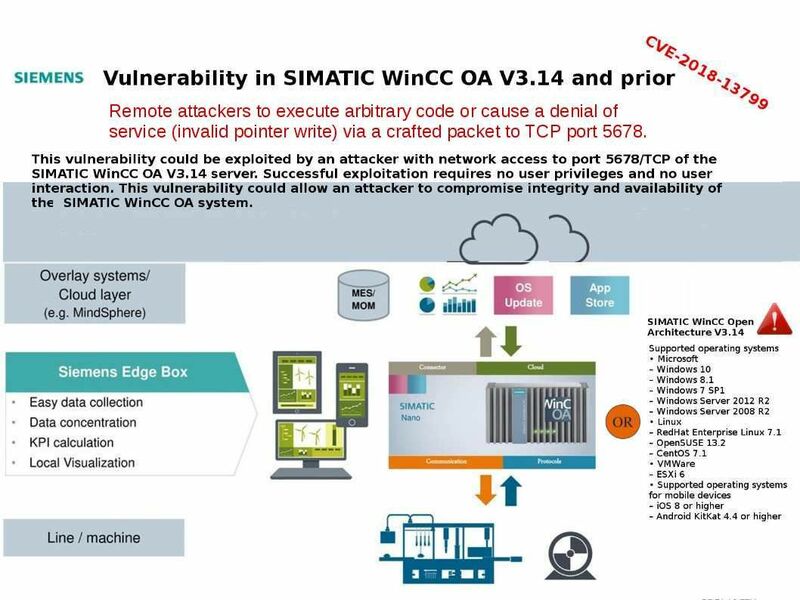 However WinCC OA v3.14 found critical vulnerability. Do you think below detail is the root causes? 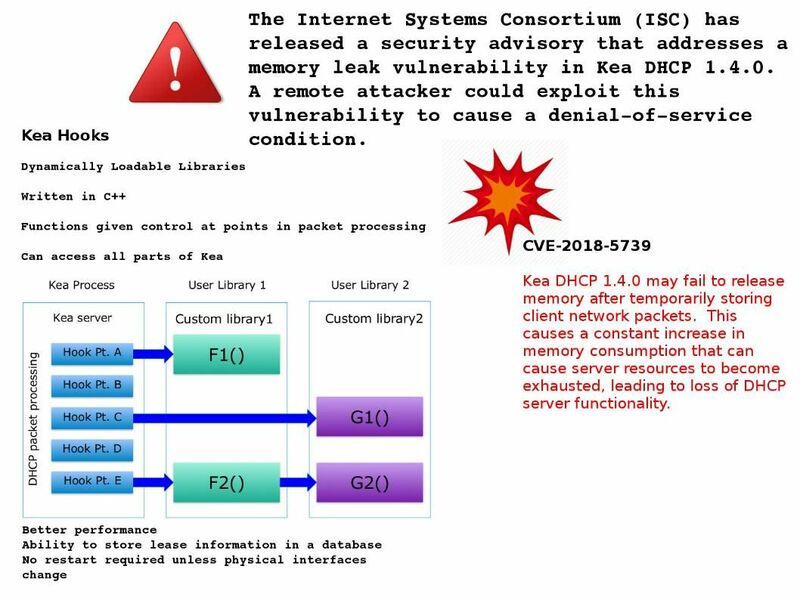 A remote attackers execute arbitrary code or cause a denial of service (invalid pointer write) via a crafted packet to TCP port 5678. So we must Protecting C Programs from Attacks via Invalid Pointer. In a nutshell, a CMS function enables anyone to build a website without a prerequisite requirement. The CMS feature similar like anytime ready to run. In a nutshell, a CMS function enables anyone to build a website without a prerequisite requirement. The CMS feature similar like anytime ready to run. 1 WordPress – With around 18 million installations, WordPress is the most-used open source CMS worldwide. 2. Joomla – With 2.5 million installations worldwide, Joomla! is the second biggest agent in the CMS market. 3. Drupal – As of January 2017 more than 1,180,000 sites use Drupal. These include hundreds of well-known organizations including corporations, media and publishing companies, governments, non-profits, schools, and individuals. Archer Technologies provided enterprise governance, risk, and compliance management software. The product aim to reduce enterprise risks, manage and demonstrate compliance, automate business processes, and gain visibility into corporate risk and security controls. Whereby, it integrate with your internal systems equivalent as workflow management especially approval process. REST API relies on a stateless, client-server, cacheable communications protocol. The HTTP protocol is use in default. Jul 2018 – What’s up involving LabCorp Cyber Security incident ? Headline News said a global laboratory company suspect encounter cyber attack this month (Jul 2018). LabCorp a leading global life sciences company, aim to provides diagnostic, drug development and technology-enabled solutions for more than 115 million patient encounters per year. As of today, we did not heard any official announce the details. However the news on article given hints to speculated the root cause. The company insider senior managers were informed that the entire computer network of LabCorp, a Fortune 500 company, was shut down across the US Sunday morning after hackers tried to access the private medical records of millions of people. Regarding to this unconfirmed cyber attack incident, can you still remember CVE-2018-10593 and CVE-2018-10595. What if attacker hunt the staff from LabCorp go through phishing email or send malicious MS Word document. It luck to evade the antivirus and firewall IPS. 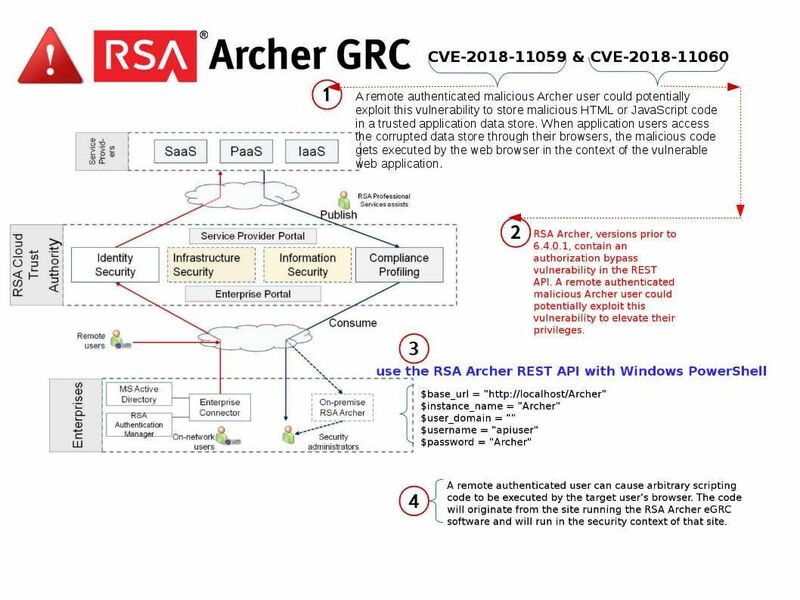 Then conduct the design weakness of BD Kiestra system vulnerabilities (CVE-2018-10593 and CVE-2018-10595). It looks that one of the data breach scenario will be successful establish. Hook/Hook Point – used interchageably, this is a point in the code at which a call to user functions is made. Each hook has a name and each hook can have any number (including 0) of user functions attached to it. Store leases and host reservations in a MySQL, PostgreSQL or Cassandra database rather than a text file. 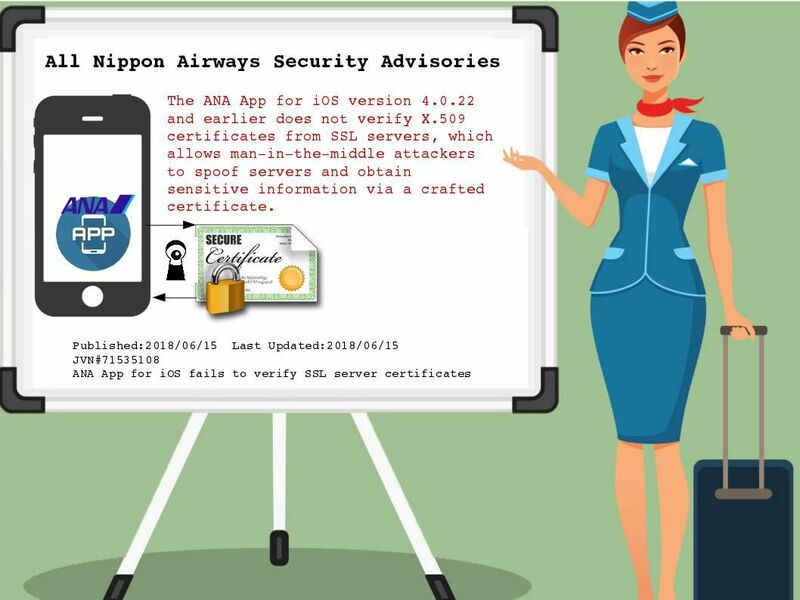 Airline application and protocol are proprietary in past 2 decades. The Airline terminal guarantee the reliability. Any counterfeit transaction or cyber attack no way to happen there. As times goes by, Airline industry react to develop mobile apps to expand the business function goal to cope with modern world. Japan airline is one of the responsible company. They are not intend to hide their mobile application design weakness. Believe that the specify design weakness not only happens on ANA airways mobile apps. May be it happen in other mobile apps but some of the company not aware or ignore.